While in your free 30 day trial, you will be able to buy more seats, even before the trial period is over. 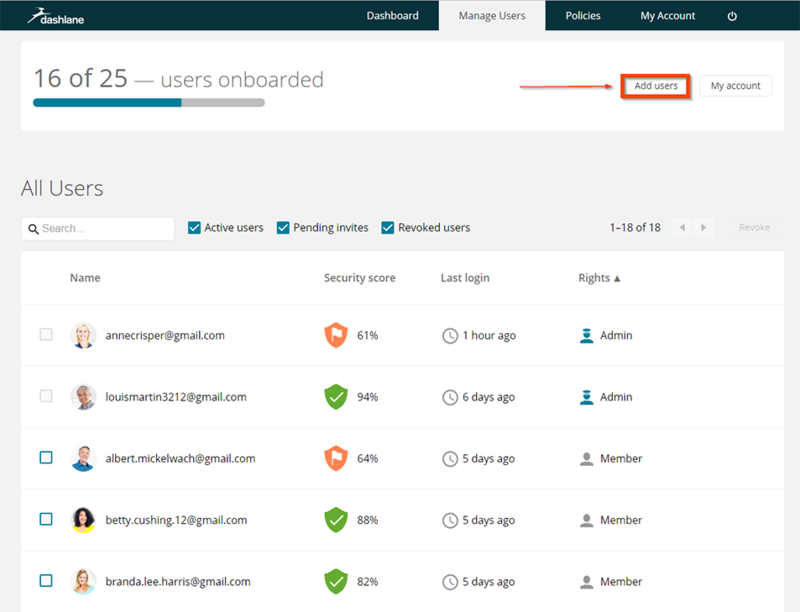 First, access your Admin Console, where you will immediately land on the Manage Users tab. Click on the My Account tab, and then on Buy Dashlane Business. A pop-up will appear and ask you to select the number of seats you would like to purchase. You could also view the price-per-seat and total cost per year of all the seats on your account. Once clicking on Next you will be presented with a pop-up to enter your payment method and billing information. Please note that upon initial purchase you will not be able to buy more seats than you initially invited to your Business account. If you have remaining empty seats, click on Add users. 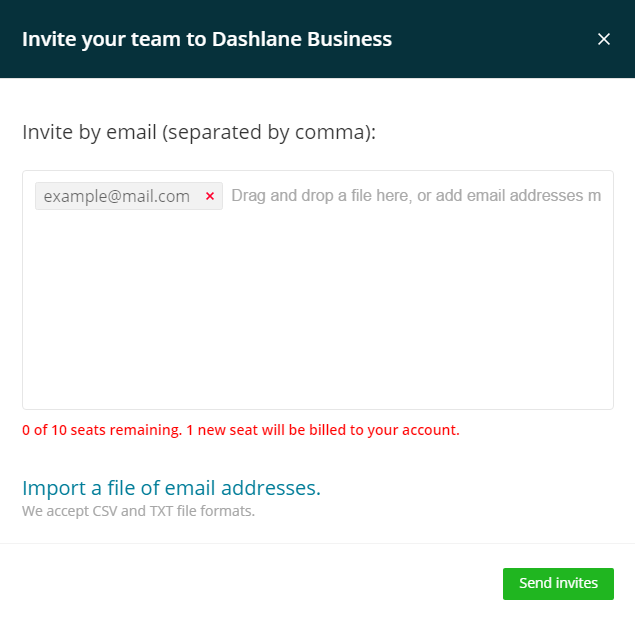 A pop-up will open allowing you to invite new members to your Dashlane Business account. To invite more users, you can enter each email address, separated by a comma, semi-column or space. You can also drag and drop, or import a file of email addresses with the appropriate format. Click here to learn more about the users import process. During the invitation process, you can see how many seats remained in your Business account. If all your seats are taken after your initial purchase, you can invite additional users at any time. You will be notified that you will be charged one seat for each new invitation sent. 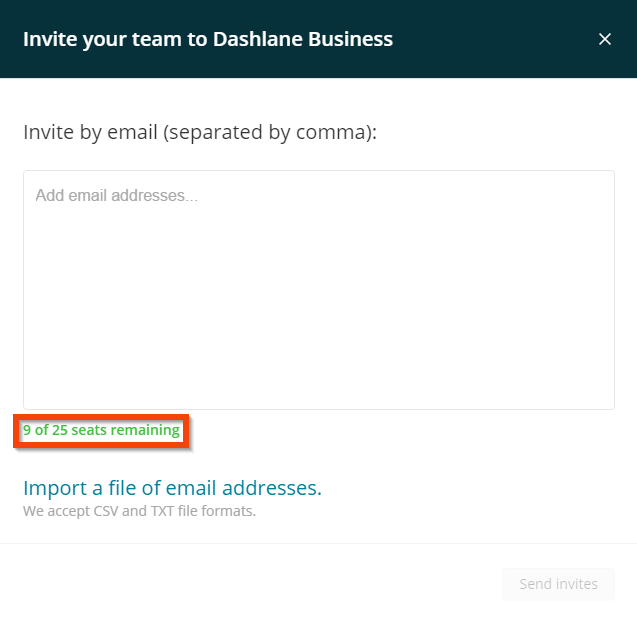 The invited members will then receive an email invitation to join your Dashlane Business account, and you can view their status on the Manage Users tab. 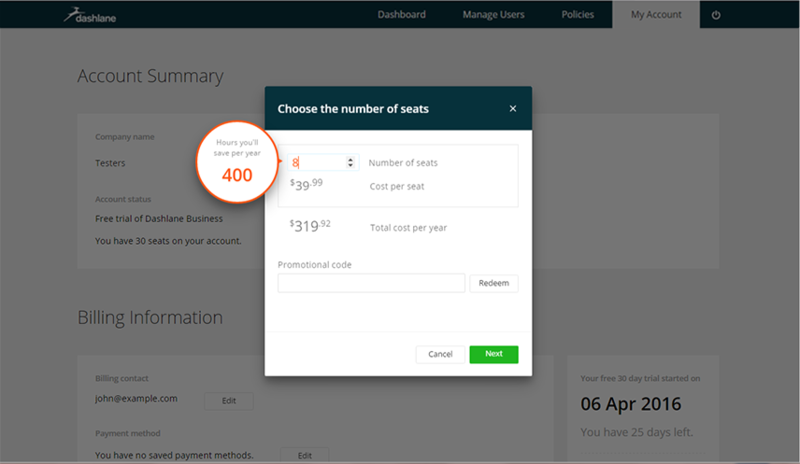 Another way to purchase seats for a Dashlane Business account, is through our website. This will allow you to skip the 30-day trial period and immediately buy seats for you and your team. Once on the page, you will be asked to fill in your account's information such as the company name, number of seats you would like to purchase and your preferred payment method. If you don't belong to another Dashlane Business account or don't have automatic renewals on your personal Premium account, please contact our support team.